Topping Rose House, an unforgettable hotel and restaurant in Bridgehampton, NY, offers something for every visitor, all year long. 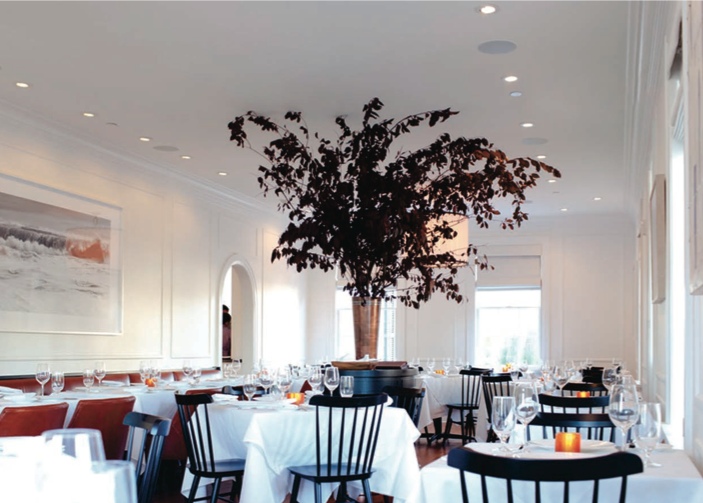 Summer visitorsto Bridgehampton, NY, who’ve enjoyed a luxurious stay at Topping Rose House, with delicious dishes by acclaimed restaurateur Tom Colicchio and chef de cuisine Kyle Koenig, may not realize that the hotel and restaurant are open year- round. But that’s good news for anyone looking for an off-season getaway to the Hamptons. The 22-room Topping Rose House is named after the firstowner of the 1842 Greek revival mansion, Judge Abraham Topping Rose. It includes not only the main house and restaurant butalso four cottages, wellness facilities, a farm from which muchof the restaurant’s bounty is sourced, and a restored barn and contemporary studio available for events such as weddings, birthday parties, business conferences, and yoga and fitness retreats. A stay at Topping Rose House off-season includes everything that a summery stay does: Seasonal snacks inspired by the ingredients available at the property’s farm, exceptional linens and electronics in the rooms, spa treatments from Naturopathica, and complimentary bicycles and car service in Lexus vehicles to and from the beach and other nearby attractions, such as vineyards and boutique shops. One of the things we love about Topping Rose House is how it seamlessly blends 19th-century aesthetics with contemporary style. Architecture firm Roger Ferris & Partners undertook the property’s renovation, and interior design company Champalimauo was tasked with emphasizing comfort, luxury, and the original antique appointments of the property. An amazing art collection rounds out the “wow” factor for people arriving at Topping Rose House for the first time, with works curated by Wächter Fine Art in New York City. Artists such as Clifford Ross and Peter Dayton provide a nice contemporary statement that goes nicely with the peaceful setting of the Hamptons. The hotel’s restaurant sources ingredients from the property’s farm and from local farmers, ranchers, and fishermen. It is open daily, serving breakfast, lunch, dinner, and brunch. It’s no wonder t hat Topping Rose House has been named to Travel + Leisure’s annual “It List,” recognized by Hospitality Design magazine for its overall architecture and design, and received an International Hotel & Property Award in 2014 for Best Hotel Design for a hotel with 50 rooms or fewer. Topping Rose House’s general manager, Fiona Riesch, is excited about the property’s plans for the winter. “Topping Rose House will host a tree-lighting ceremony with local carolers and offer special menus in the restaurant for Thanksgiving, Christmas Eve, Christmas and New Year’s Eve as well as the Winter Spa Escape (from $1,299 per night) and A Taste of Winter (from $659 per night),” Riesch notes. “The property will be fully decorated for the season with a festive Christmas tree in the main house. Additionally, guests can enjoy complimentary vin chaud with a house-made spice recipe by the fireplace after returning from a brisk fall or winter walk in the area,” Riesch adds. To learn more, visit toppingrosehouse.com.